Fusion Crystal Clear Cling is an optically clear window cling engineered specifically for high heat toner production equipment. It is an incredibly durable digital synthetic window cling, and makes the perfect option for those interested in custom window clings that are not white or frosty clear but truly optically clear. Fusion Digital Paper™ invites you to discover the window cling option made for high heat toner production equipment. From the moment you take the cling off the release liner you will notice how it virtually jumps right on the glass with great cling strength. Perfect for window stickers of any shape or size. Use our Fusion Crystal Clear Cling as window or car decal paper and more. Application of our window cling paper products is easy. You can apply dry using a felt squeegee to get the air bubbles out. Or you can first apply water to the glass with a sponge or spray and then apply your clear window cling and follow up with a felt squeegee to “wet out” the air bubbles. 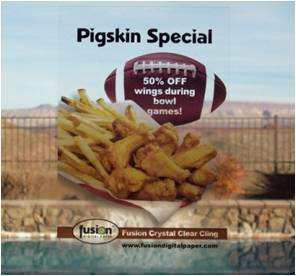 In both cases, please note that the Fusion Crystal Clear Cling will “wet out” and actually appear clearer after 48 hours. Best of all, your custom window clings can be removed from the glass and reapplied multiple times. 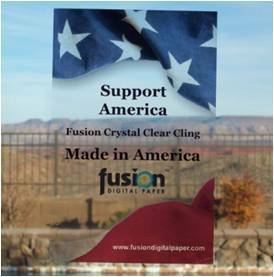 Below we have included a photo of our patriotic “Made in America” window cling. This beautiful window sticker was printed so it could be placed on the inside of your window for direct viewing. The second photo is an example of reverse printing, which allows you to place your sign on the inside of a window so that it will be viewed clearly from outside the building while being protected from the outside elements and mischief. Fusion Crystal Clear Cling’s smooth surface provides great print fidelity. Furthermore, it makes the message very readable while not obstructing the view outside the way an opaque cling would. In addition, the toner adhesion is excellent, and like all Fusion Digital Paper™ products, they are engineered for high heat toner fusing and designed for safe runnability on your equipment. Also, our polyester window cling material will not stretch, sag, yellow, get brittle or crack like vinyl paper does. We are committed to bringing you the most innovative digital synthetic products available. 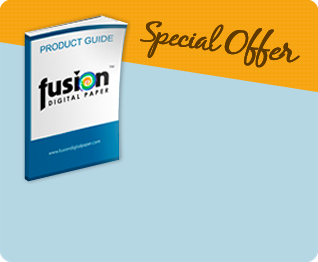 After all, the only thing more exciting than developing new Fusion Digital Paper™ products is selling them. Such a product is Fusion Crystal Clear Cling, the best way to produce fast, cost effective, short run digital sheet fed window clings and car decals.